Long after the Super Bowl is won, the commercials linger—on our minds and our flat screens. But one company in particular stood out this year, and has for over a decade. It’s obvious that Budweiser is making bold statements here about what they’re not. “Not a hobby.” “Not imported.” “Not following.” While other large domestic brands are now attempting to relate to consumers of small-batch brews, Budweiser has no interest in comparison. They recognize that they have a specific—albeit wide—target market who appreciates their product for exactly what it is (cue the charming gentleman served with fruit in his beer). Too often companies treat their marketing campaigns as their sole opportunity to communicate with consumers, desperately packing as much information as they can into one ad. This tends to overwhelm a consumer though, causing them to either A. completely shut you out or B. attempt to pay attention, only to forget your message entirely the moment something more stimulating crosses their path. Budweiser keeps their message here to concise sentences that strike home the same point—“we’re not going anywhere.” Think of your target market as a passerby on the street. You have a few fleeting moments to impart your message as they walk away. Keep it brief, keep it interesting, and repeat it as often as you can. 3. Everyone is not the target market. Beyond perhaps filtered water and utilities, few companies can truly say their consumer is “everyone.” And yet, so often companies cast such a wide net that they lose any kind of distinct brand message, chasing the personal preferences of anyone who will listen. 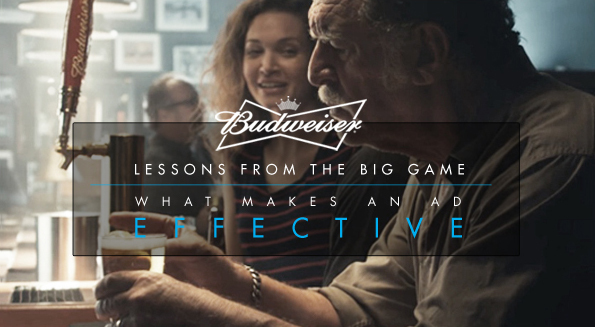 But instead of trying to tell you how the hops they use are just as good as a microbrewery’s, or how their company was born from small beginnings, Budweiser boldly recognizes that they did not become this successful as a large, domestic, non-trendy brand by accident. And so they embraced that, realizing their differences are actually what sets them apart as a brand. And while traditional marketing strategy might tell you to “fish where you see the other boats”, Budweiser sought out a patch of open sea and claimed it for their own. So what makes an ad effective comes down to is knowing your target audience and knowing how to engage them in a memorable way. The hardest part to this equation is not every audience is easy to reach and not every idea is compelling enough to sway your audience which is where using an experienced agency is vital. The next time you see an interesting advertisement campaign, ask yourself the question of what makes an ad effective and maybe you’ll notice more than just what is on the surface.